Choose the Copy as Path from the menu. Here's an example of what's on the clipboard after clicking that: "C:\autoexec.bat". This will also allow you to copy the path of a folder to the clipboard. Note: In Windows XP there is no built-in functionality for that. 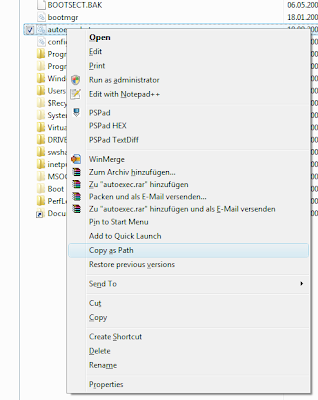 But have a look at http://www.winhelponline.com/blog/add-copy-as-path-option-to-the-context-menu-in-windows-xp/, there are two alternative methods discussed how to provide it even so.